The media coverage about Gates Orlando’s heart transplant has focused on how fortunate he was to finally receive the gift of life. That came after he was kept alive by an artificial heart. After more than two years of non-stop critical care — and 208 days after he last stepped outside Strong Memorial Hospital — Rochester Americans Hall of Famer Gates Orlando finally got to go home on Friday. Just 25 days after receiving a life-saving heart transplant, Orlando slept in his own bed in his home in Victor. “I haven’t breathed fresh air since Aug. 9,” he said Friday morning. Orlando, 50, had lived without his own heart — and with total reliance on an artificial heart — since April 4. 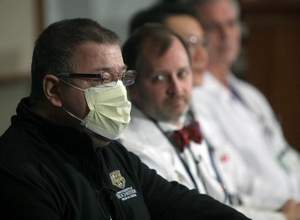 When a donor heart became available Feb. 4, the transplant teams were mobilized for surgery that day at the University of Rochester Medical Center. For now, he must wear a surgical mask and gloves outside of his living space, and may need to do so for up to a year, as a precautionary measure to guard against infection and disease. Medication to assist his body’s acceptance of the new heart has weakened his immune system, doctors say. But as he recovers, adjusts and regains physical strength, he will live a very normal life, his team of doctors said.